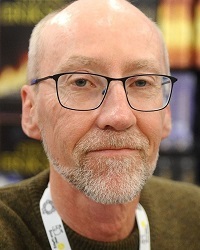 Marcus Gipps at Gollancz has signed Rejoice, A Knife to the Heart, a new science fiction novel from bestselling fantasy author Steven Erikson. Gollancz has world (exc NA) rights from Caspian Dennis at Abner Stein on behalf of Howard Morhaim of the Morhaim Literary Agency. The US publisher is Promontory Press. Rejoice, A Knife to the Heart tells the story of the Intervention, which begins when Samantha August, science fiction writer, disappears into a beam of light, apparently from a UFO, while walking along a busy street in Victoria, Canada. Samantha wakes up in a small room, where she is greeted by the voice of Adam, who explains that they are in orbit and he is AI communicant of the Intervention Delegation, a triumvirate of alien civilisations seeking to ensure the continuing evolution of Earth as a viable biome. Erikson said: "I am delighted to be with Gollancz as I venture once more into the SF market (this time on a serious note), beginning with my First Contact novel, Rejoice, a Knife to the Heart. I look forward to this new chapter in my writing career and working with the terrific team at Gollancz." Gipps said: "I've admired Steven's excellent fantasy series for years now, and was thrilled to receive this page-turning yet thoughtful science fiction novel. I love First Contact narratives, and this adds much to the genre - not least a chillingly plausible alien sense of what the human race needs next." Erikson is the author of the Malazan fantasy novels, published by Transworld.